The third of Stratford's "House of Atreus" series is also the least successful. The main culprit is Peter Lichtenfels' awkward direction. When he can't make dramatic sense of the more didactic sections of Sartre's 1943 work, he has them played for laughs which hardly shows much faith in the text. This uncommitted approach leads, unsurprisingly, to a tedious, unengaging evening. 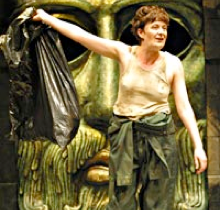 If Stratford had decided to produce Aeschylus' original trilogy, the third play would have been "The Eumenides". After witnessing Clytemnestra's horrific revenge on her husband in "Agamemnon", and her children's revenge on her and her lover Aegisthus in "The Libation Bearers", Aeschylus examines the primitive nature of revenge in "The Eumenides" and shows the establishment of law and trial by jury as the gods' solution for sublimating man's bloodthirsty passions into a more rational system. Sartre, of course, is an existentialist and has no time for Aeschylus' plaidoyer for the gods and the status quo. In this his first play, Sartre turns Aeschylus' theme into a morality play supporting his own existentialist doctrine. To be free, man must take full responsibility for his actions and not assume there is any other authority over him but himself. Man must rid himself of all concepts of fate, gods or morality dictated from supposedly divine sources. This message is hard to miss since Sartre spells it out in so many words at the play's conclusion. An audience having seen the first two instalments of the "House of Atreus" series will be unhappy to find that the first half of Sartre's play rehashes central plot of Giraudoux's "Electra". Thus we have to witness yet again the meeting of brother and sister, the relating of the Clytemnestra's revenge and the siblings psyching themselves up to commit their own revenge. With such an overlap, "Electra" and "The Flies" should not really be staged sequentially. Sartre's Electra is a tomboy, made a servant by her mother and stepfather, who carries out daily but ineffectual protests against them as she waits for Orestes to arrive to take action. Argos has become a haven for flies, attracted by the stench of death that infects the place. As the play begins Orestes and his tutor find themselves in Argos on the Day of the Dead, a ceremony instituted by Aegisthus, when the dead supposedly come back to torture the living with guilt. Quite obviously this yearly ceremony is an expansion to the public of Aegisthus' own private suffering. Spurred on by Orestes' arrival, Electra attempts to demonstrate that the people of Argos are in the throes of a mass delusion and that the "dead" go away if one simply refuses to believe in them. Her plan is thwarted by a mysterious stranger, Jupiter in disguise, who creates a supernatural event to thrust the people back into submission. The second act foregoes drama to preach the existentialist gospel and ends with a debate between Orestes and Jupiter where Orestes proves that Jupiter may need him but he does not need Jupiter. Orestes, unlike the inexplicably weaker Electra, is ready to experience true freedom fully aware of the loneliness it will entail. Far more imagination than Lichtenfels demonstrates is needed to make so didactic a play involving. His confusion is evident in his treatment of the title characters. Making silly scissors-like hand movements, they first appear in gasmasks, seemingly half muscid, half human, and a clever reference to the time the play was written. Later they turn up without the masks but with dark circles around their eyes as if in a 1920s expressionist film. Even though they have always been identified as the Furies (aka Erinyes or Eumenides), when they are called on to assail Orestes and Electra, their group no longer includes men and they alternately buzz like flies and bark like dogs. (Are they dogflies?) At no time are they frightening, and the show plays out more like a lesser episode of "Star Trek" than Greek myth. Karen Robinson (Clytemnestra) and Scott Wentworth (Aegisthus) repeat the roles they had in the previous two plays while Dion Johnstone (Orestes) and Sarah Dodd (Electra) reprise the same parts they had in "Electra". Dodd continues to give an underpowered performance, probably meant to convey cynicism, but is too devoid of intensity for the character. Robinson's queen is still the self-absorbed matron she was in Giraudoux. Wentworth's Aegisthus has now become a grotesque caricature seemingly modelled on Marlon Brando in "The Godfather". It falls to Johnstone single-handedly to raise the tone of the production with a sense of heroism, commitment and vision. It's a pity his strong performance has to struggle against so much directorial mediocrity. Steve Cumyn, rather indifferent in the previous two plays, really blossoms in the major role of Jupiter. Cumyn gives him an attractive personality as a witty observer and sly trickster that helps mitigate play's gloom. He is so effective we ignore the central problem of the play--namely, that Sartre shows us that Jupiter and the Flies exist even though he wants us to realize that they don't. Walter Borden provides much-needed comic relief and sense of humanity as Orestes' unadventurous Tutor. In smaller roles Sara Topham (the Young Woman), Maria Vacratsis (Old Woman/First Erinye) and Jeffrey Wetsch (the Idiot Boy) all turn in fine performances. Lorenzo Savoini, designer for all three "House of Atreus" plays, unaccountably adds doors to Agamemnon's palace for "The Flies". Red, used for the carpet of dresses in "Agamemnon" and the bunting in "Electra", now appears in an ill-conceived portrait of Jupiter trailing on the stage so that actors either trip on it or awkwardly avoid it. Wendy Greenwood's dim lighting levels contribute to the picture of Argos as a doomed city and it is a relief when she pulls out all the stops for Jupiter's glorious vision of the world of order he has created. With Sartre's first and second plays both on the playbill at Stratford, it becomes clear why he is better known as a philosopher than a playwright. Shaw and Brecht are both accused of didacticism, but Sartre doesn't have the wit of the former or the dramatic flair of the latter. To make the plays work the director must supply what they lack. Neither Jim Warren in "No Exit" nor Peter Lichtenfels in "The Flies" has developed a sufficiently imaginative strategy for their productions. Besides this, Sartre's version of Aeschylus can only have its fullest effect if an audience is already familiar with Aeschylus' version. How much better it would have been to have presented Ted Hughes' translation of Aeschylus' complete trilogy first before moving on to later interpretations of it. Photo: Sarah Dodd as Electra. ©2003 Stratford Festival.